Okay, so the thing about sunglasses is that they can solve a major issue that most people have. The issue is squinting. I see so many people walking around outside practically blinded by the sunlight. They have their hands over their eyes, and they look like they are wincing in pain, almost as if someone's about to strike them with a stick. Honestly, squinting is not good for you. It gives some people headaches, and the sun is harsh on your eyes. Plus squinting is not good for your skin. Hello wrinkles! So why do you guys make it harder on yourself? And don't give me that excuse that you can't find any sunglasses you like. I mean serious Sunglass Warehouse has a big selection to choose from. Whether you want something just for fun or because you have a practical need. I have two pairs of sunglasses from Sunglass Warehouse. These are my Rockingham Retro Style Sunglasses - just $13.95. I love the amber lens! These are a great fashion accessory too. And these are my Flathead oversized aviator style sunglasses which are just $13.95 as well. They have a smoke colored lens. Both pairs are polarized which means I don't have to deal with the blinding glare of the sun when it bounces off cars in front of me as I drive. It's also great if you're going to be around water. This is how you look when you don't wear sunglasses. 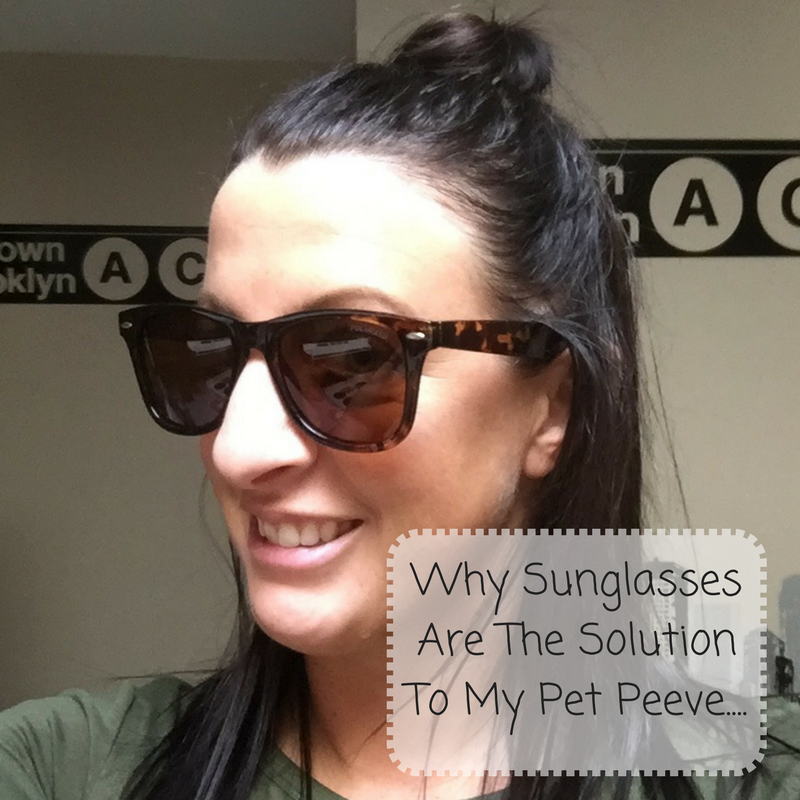 Seriously, wearing sunglasses is a much safer and more fashionable alternative to driving or walking around with your face scrunched up, wincing in pain as if you're about to be hit with a stick. It's also better than having to shield your poor eyes with your hand. Plus, sunglasses are a great fashion accessory. They are functional AND fashionable. So are you going to start embracing sunglasses? Well good, because today you have a chance to win a free pair from Sunglass Warehouse! Ha! Love this. Total pet peeve of mine too. I wear sunglasses all the time when it's any way bright out! They seriously help with snow glare around here, too! I like the Noosa shades in the blue. I would have loved to see your dog in shades. Cabo is what I would pick, just can't decide on the color.